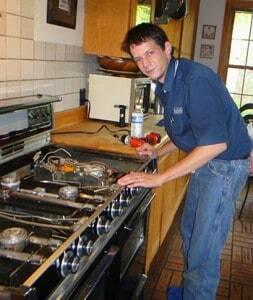 Well-built appliances withstand the test of time, especially when they receive routine maintenance. Recently, we were asked to fix an American Crown Range product. The manufacturer has been out of business since the mid-‘80s, and we didn’t know when this range was made. In cases like this, C&W Appliance Service can’t guarantee it can fix all problems because parts and repair manuals are no longer available. However, our technicians use their exceptional knowledge of electronics and oven repair and usually come up with a solution. In this case, the clients were concerned that they’d have to replace their vintage 40” six-burner stove with double ovens and double broilers if they didn’t want to plug in the range every time they wanted to cook, and then unplug it every time they were finished. The old enamel-and-chrome appliance complemented their home, which was built in 1926. You may find it interesting that we assigned one of our youngest technicians to the case. Austin Sandel is only 24 years old, but he’s been working for us for five years. I’ve known him and his family even longer. He’s a whiz at mechanics and electronics. In fact, Sandel took apart a VCR and put it back together when he was around 6. His first job was assisting automotive mechanics when he was 13. I felt confident that he could figure out why the old range was having problems with its electronic spark ignition system – even without an oven repair manual. As soon as Sandel began dismantling the range, he diagnosed the problem. The wires connecting one of the dials to the gas burners had been damaged. He tested the lines and confirmed the problem. With wiring on his repair truck, he proceeded to rewire all of the igniters (doing a little preventive maintenance at the same time), and the oven repair was complete. It’s funny; Sandel has been turned away from a few appliance repair jobs because clients thought he was too young to know what he was doing. Rest assured that we didn’t become the only Sub-Zero and Wolf factory-certified premier partner in Dallas, Fort Worth and San Antonio without hiring the best technicians in the region. C&W Appliance Service is the only Sub-Zero Premier Partner and factory certified Sub-Zero & Wolf appliance service provider in the Dallas, Fort Worth and San Antonio area. Contact us today to schedule an appliance repair appointment. Call us toll-free at (855) 358-1496.